The SOM1 Soil Oxygen Meter is a stand-alone logging instrument for the measurement of soil oxygen content (%) of soils. The SOM1 can support up to five ICTO2 Soil Oxygen Sensors. The SOM1 is a continuously logging instrument, for the in-situ measurement soil oxygen content (%). Sensors are designed to be installed in the field for days to years at a time. The ICTO2 Soil Oxygen Sensors are individually calibrated by ICT International’s technicians. The calibration is stored within the SOM1 for highly accurate and reliable soil oxygen content measurements. The SOM1 is a fully self-contained unit requiring power input from a 20W solar panel (field applications) or 24V power supply (glasshouse applications). Communication is via a USB port or wireless connectivity. The SOM1 is IP-65 rated and has a Windows and Mac compatible GUI for complete logging solutions including look-up tables, scripts and sensor calibration capabilities. asam humat / humic acid AH-90 : Merupakan humus yg di proses melalui purifikasi dan analisis cermat, bekerja mengaktifkan proses fisika maupun kimia (kegemburan, konversi unsur tersedia, pH buffer, pengikatan air,uptake KTK, sifat koloid, dsb.) , dan biologi tanah (Upgrade pembentukan dan respirasi akar, kalatis organik,stimulan enzim, permeabilitas, biomassa tanah,medium transport hara,lumbung mikro-meso tanah ). Tingkatkan jumlah P terlarut, dan K terfiksasi. Sehingga total fungsi tanah di top performance. AH-90 asam humat bentuk powder halus berwarna hitam dan tidak berbau . Herbisida selektif, sistemik pra tumbuh berbentuk pekatan suspensi berwarna putih. untuk mengendalikan gulma berdaun sempit dan gulma berdaun lebar pada tanaman jagung, nenas, pisang, tebu dan padi gogo. Herbisida sistemik purna tumbuh berbentuk larutan dalam air untuk mengendalikan gulma pada pertanaman karet (TBM), padi sawah dan tebu. Merupakan herbisida purna tumbuh yang diformulasi dalam bentuk larutan yang mudah larut dalam air yang dapat mengendalikan gulma berdaun sempit, berdaun lebar dan teki-tekian. Diformulasikan dengan menggunakan teknologi biosorb. Gulma sasaran: Alang-alang, Gulma Keras, Gulma Sedang, Gulma Lunak. High Frequency moisture meter MS350A is used for measuring moisture content of soil ,silver sand, chemical combination powder, coal powder and other powder materials. It applicable of chemical industry and other relevant industry. moisture whilst in storage, therefore processing will be more convenient and efficient. 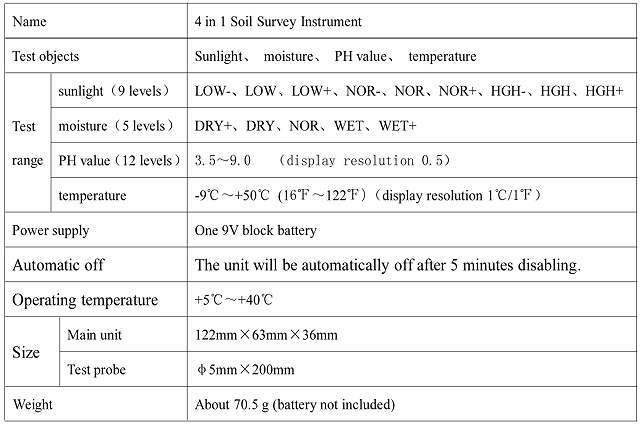 This is a 4 in 1 digital soil moisture meter, pH, temperature and light tester well. It has a sensitive 200mm probe and light sensor window provides 5 units of accurate & precised measured results, pH, moisture, sunlight. It can assures quality of flowers and grasses planting, garden virescence,and landscaping. Calibration:Factory calibration,no need to re-calibration. Use:Crops,orchards,lawn maintenance,large area of cultivation,laboratory research,etc. 3.Directly insert it into the soil to detect,use more convenient. 4.Simple and convenient operation,long service life. 5.This product can not be used for aqueous solution measurement. A screw conveyor or auger conveyor is a mechanism that uses a rotating helical screw blade usually within a tube, to move liquid or granular materials. They are used in many bulk handling industries. Screw conveyors in modern industry are often used horizontally or at a slight incline as an efficient way to move semi-solid materials, including food waste, wood chips, aggregates, cereal grains, animal feed, and many others. The screw feeder conveyor consist of a trough or tube containing either a spiral blade coiled around a shaft, driven at one end and held at the other, or a "shaft-less spiral", driven at one end and free at the other. The rate of volume transfer is proportional to the rotation rate of the shaft. In industrial control applications the device is often used as a variable rate feeder by varying the rotation rate of the shaft to deliver a measured rate or quantity of material into a process. Screw feeder conveyors can be operated with the flow of material inclined upward. When space allows, this is a very economical method of elevating and conveying. As the angle of inclination increases, the capacity of a given unit rapidly decreases. 1. The machine is especially suitable for conveying all kinds of powdery material, also can be used for conveying all kinds of granular or flake materials. 2. Using unique designed stainless steel screw-shaped blade. 3. High conveying capacity, safe and reliable operation, easy to disassemble and clean. 4. Good adaptability and long service life. 5. Good sealing quality and rigidity. China grading analysis 200mm soil test sieve is an effective method for particle size measurement. It is commonly used for Quality Control in almost all industries such as chemicals, mining and metallurgy, food, cosmetics, pharmaceuticals and any laboratory involved in particle size analysis. The displayed standard test sieve is a good helper for particle size analysis. 200mm high precision sieve testing instrument is an effective method for particle size measurement. It is commonly used for Quality Control in almost all industries such as chemicals, mining and metallurgy, food, cosmetics, pharmaceuticals and any laboratory involved in particle size analysis. The displayed standard test sieve is a good helper for particle size analysis. 1.In achieving high precision and high mesh screening at the same time, control of a narrow size range. 3.Ensure that the processing characteristics of the material unchanged. 5.Thoroughly screen self-cleaning function: greater than 500 mesh sieve, mesh-free jam, no attenuation of screening efficiency. 6.1-70% can increase screening accuracy, output can be increased 0.5-10 times.